Rise of Shadows is the latest expansion for Blizzards extremely popular card game, Hearthstone. It releases on the 9th April and includes some fantastic new cards to unlock or you can purchase a bundle pack now if you want to get a chance in getting ahead of your opponents by getting some of the brilliant new cards available. The developers have announced their first tranche of card reveals which they will do on Twitch and you can see the schedule of the card releases here. Some fantastic cards have been revealed already and we'll post them for you here below. 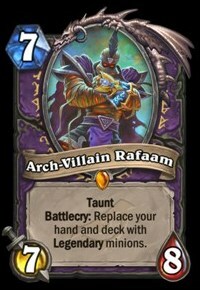 My favourites so far are Arch-Villain Rafaam just because of his Battlecry ability to get the minions in your hand and deck changed to legendary cards and the fact that he is a 7 / 8 taunt card is pretty decent at that end game too. You know with the legendary cards you'll be getting from his ability will make the end game very interesting for you and can easily turn the tide of the game. 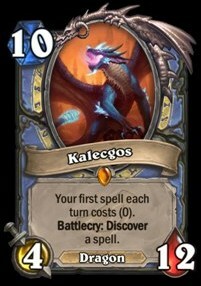 I also like Kaleegos not because he is an absolute beast being a 10 mana crystal 4 /12 dragon but if you're using a Mage deck with some decent spells in there you can really control your output of mana in the late game where you can do some real damage and effectively wipe the board if you need to quite easily.